A few months ago, Democrats had a commanding lead in a number of polls and talks of a Blue Wave had the GOP rattled. But a lot has happened these few months. A series of missteps, unforced errors, and flat out embarrassments and three weeks before the midterm elections, polls are skewing red. Christine Blasey Ford was the October surprise that backfired and then blew up in a blaze of glory, while simultaneously doing the impossible — uniting the furthest regions of the right with the so called “establishment” who was leading the charge in ensuring Kavanaugh’s confirmation. Mind you, NBC was the network that ran with an anonymous letter, reporting it as though a fourth Kavanaugh accuser had come forward, they interviewed Julie Swetnick, whose claims against Kavanaugh were hilariously debunked, and touted text messages (which they did not publish) between Ford’s associates as proof that Kavanaugh lied. But back to the poll. Thanks to a strong economy, Democrats are highly unlikely to claim massive victory in three weeks. “A six point differential is not something that’s going to cause a big electoral wave,” said Micah Roberts, the Republican pollster on the CNBC poll, a partner Public Opinion Strategies. “Economic confidence that people have among a lot of groups is providing a buffer” for Republicans. Indeed, the poll found that 48 percent of the public is optimistic about the current economy and optimistic it will get better, the highest level in the poll’s 11-year history and more than double the 20 percent registered in the December 2016 survey. The poll, conducted Oct. 4th through the 7th, shows 83 percent of Republicans are optimistic but also 22 percent of Democrats and 40 percent of Independent voters. Still, Jay Campbell, the Democratic pollster for the survey and a partner with Hart Research Associates, is skeptical of a wave for the Democrats, saying the six-point advantage is “not enough to suggest this is going to be a massive wave election a la 2010.” Campbell did add that the survey found a large 17 percent of undecided voters who will be critical to the outcome. Like many polls conducted for the 2016 elections, much methodology doesn’t consider shifting voting base. In 2016, a substantial number of people, not youngsters, but middle-aged voters, showed up to vote for Trump. Many had never voted in an election before or hadn’t voted in decades. Those individuals were never considered in polling. Not to mention the number of Trump supporters who hesitate to express publicly their support for fear of retribution. None of this is to say that the GOP can rest on its laurels headed into midterms, but barring some massive shift in political climate, Democrats may make electoral gains, but they’re likely to be much smaller than anticipated. STOP IT CNBC! STOP IT HAHAHAHAHAHAHHAHAHAHAHHAHA! They polled 800 people. I’m going to sleep. But those 800 included all the 130 people who were in Lizzie Warren’s faked DNA sampling, so……. The MOB MSM says that counts! I’m throwing in a little math here. From simple statistics, with a coin toss, such as an election, the average error in percentage in a TRULY RANDOM sample is 1/2 the square root of N divided by N.
There’s close to a 98% chance that the TRULY RANDOM sample is within the square root of N divided by N.
(square root of 800)/800 = 0.035 of the REAL total, so the SAMPLE SIZE criticism would be invalid for a monolithic voting block. Having said that, there ARE valid criticisms. Number 1, is this truly a RANDOM sample? The probability that I will be sampled is zero since I screen my calls and only answer when I can identify the caller- a product of the “telemarketer” craze. I presume most people who have a life and don’t want to waste time talking to telemarketers fell the same, and will not be sampled. This could skew statistics some. An ADDITIONAL factor is that states are not monolithic. The probability that a Republican will win the governorship of California is just about zero. Likewise, the probability that a Democrat will pick up the Texas senate seat is just about zero. Voters are not randomly distributed throughout the country. Pollsters DO adjust for those in their predictions, but the adjustments are based on guestimates assuming CURRENT voting patterns by state will be similar to PRIOR voting patterns. Square root of N over N is the formula for standard deviation in a Gaussian distribution ONLY. Many random processes are well described by the Gaussian distribution, but many are not. Mainly depending on how you set up the problem, the Poisson distribution can describe the exact same processes, even though the curve looks nothing like the Gaussian one. There are other random distributions but they’re not so often encountered. In any case, the idea that voters can be handled like random variables is not a reasonable one. Coin flips can be random. Nuclear decay usually is. Voters? Get real. In the Gaussian distribution, 99.7% confidence is THREE TIMES the standard deviation. One standard deviation (in this case, that 3.5%) gives only 68.3% confidence, which is nothing to get excited about. Since the 1970s, pollsters have been including some error estimate in their figures. The figure is invariably this Gaussian standard deviation, even though it is wildly inappropriate. They disguise this a bit by changing the name they give this estimate—it used to just be a rather generic “error”, more recently they’ve been calling it “random counting error” (which it certainly is not), and then for a while they were tossing around “percent” and “percentage points” interchangeably, which is like confusing the Junior League with the Little League. Every time I see a poll I mentally check the given error figure. In forty years, I’ve never seen one which was done competently. This is the primary basis for my usual claim that the polls are crap—the people doing them are mathematical barbarians and their work is useless. In any event, the math of random processes is only a tiny part of the polling problem. They tend to be swamped by the vastly greater systematic errors. Systematic errors are things like polling only the sort of people who don’t mind wasting time talking to pollsters, rather than polling actual voters. Even that is almost impossible, as witness the bizarre results of exit polls. How can that go wrong? Well, it does, time after time after time. In short form? Rule #1 of polls—the polls are crap. Rule #2 of polls—read Rule #1 again, but this time, believe it. A little too much math. Yeah, a truly random 800 would be plenty. But if they had to make 20,000 calls to get 800 people to answer them… the systematic error becomes intractable. The corrections are larger than the effect you’re trying to measure, and the corrections are more-or-less an educated guess. Here’s another little bit of math. According to Rush, there are about 3.5 million more registered voters than there are eligible citizens. Guess which party they likely belong to. She wears the ugliest clothes of anyone, even Hillary. I love it when they start managing expectations. The blue wave can only be stopped if a red wave shows up. Don’t expect others to carry the water for you on election day. Show up and vote. I have never seen a President who campaigned so tirelessly for the MidTerms. Jeep. 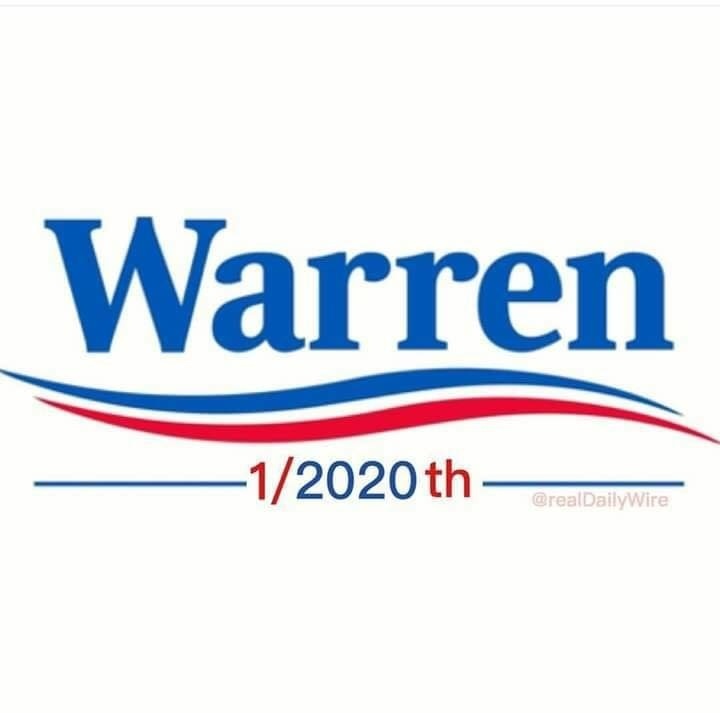 Official sponsor of the Warren Campaign. Anecdotally, I’ve seen no indications that favor Democrats while I’ve seen a bunch favoring Republicans. Coupled with the problems in poll modeling mentioned above, and I come away thinking this could be a red wave. The only thing I worry about is massive Democrat voter fraud, which is possible given how unhinged they’ve become. I hope every red state Sec. of State is prepared for that. But we aren’t interested in races ACROSS THE COUNTRY, we’re interested in swing districts. Nobody cares about the opinions of a 99.3% Democrat district in San Francisco. When you restrict polling to 66 swing districts, the polls are GOP +1%. I predict the Dems will be stomped. Not a red wave, not a red tsunami, but a bright blood bath cause by red rivers spilling across our land. I acknowledge that 3.5 million more registered voters than there are eligible citizens could spoil my parade. But I look forward to election night. JUST MAKE SURE TO SHOW UP AT THE BALLOT BOX ON ELECTION DAY NO MATTER HOW LONG THE LINES MAY BE AND CAST YOUR VOTE FOR EVERY REPUBLICAN ON THE BALLOT. Preferably, go to the Polling Place to vote and don’t vote absentee so that your vote ends up in a dumpster uncounted. And while you are there, keep your eyes and ears open for irregularities or suspicious activities, especailly in Counties that are controlled by a Demtard Election Official as was the case in St. Lucie County, Florida. Video with your Smartphone anything suspicious and employ the tool that the Demtard Socialist and Anarchist use. Don’t rely on your fellow Patriots to do your job to get these freaking Demtard Socialists and Communists out of seats of power before they make our Country look like Venezuela.